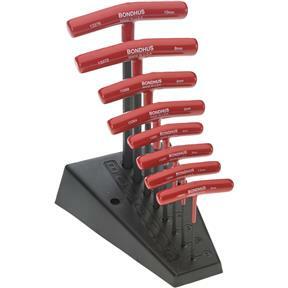 Hex T-handles feature welded steel handles with cushion grips sized for maximum torque while protecting the hex tip and screw from rounding or stripping. The cushion grip handle is ergonomically shaped eliminating pressure points. The heavy duty handle generates flywheel effect for fast insertion and extraction of screws. 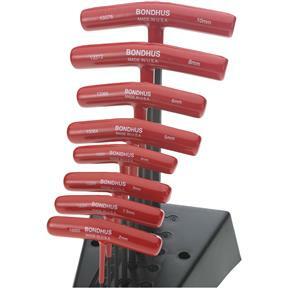 Comes with a molded stand that mounts on the wall or work bench. 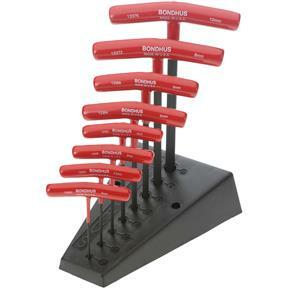 Only available from Bondhus, Protanium® steel means these are the strongest tools available.